I must admit, I don't have expectations for Jodie Foster's rare directorial effort we'll see later this year. And it's not just that it stars Mel Gibson as Foster's husband. 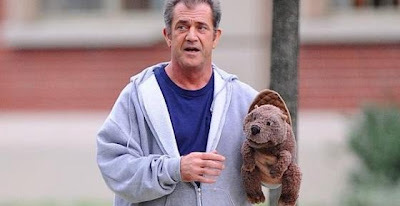 It's also that Gibson's character, Walter Black, carries a beaver puppet on his hand who he talks to. Even if this screenplay is good, how can this film be anything but a mash up of concepts of films like Harvey and Lars and The Real Girl. I like Harvey, I like Lars, and I even like Mr. & Mrs. Beaver from The Chronicles of Narnia. But not sure I like the idea of this film. can't get my head around that. And thanks, I'd forgotten about Mr and Mrs Beaver, and I thought they were unforgettable.